In the 2000 Republican primary, the party establishment backed George Bush over John McCain, so the venom came out heavily against McCain. 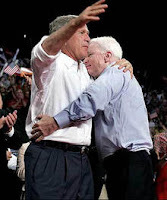 Dubya's campaign claimed McCain was a traitor (lie), had an illegitimate black child (lie) and was gasp a liberal (opinion, but meant to scare "the base"). The truth is that John McCain was a patriotic soldier who spent 4 horrible years as a prisoner of war, where he was tortured. The Republican Party had no problem with trashing him anyway. In the 2004 presidential race, the GOP smear campaign similarly "swift boated" John Kerry, spreading vicious lies trying to convince people that this bona-fide war HERO was actually a cowardly traitor. McCain spoke out against his own party's tactics on this, and called it "dishonest and dishonorable." So, one would think that John McCain would not be particularly inclined to embrace dubya, those campaign tactics, or US torturing of prisoners who may or may not have any charges against them. You'd be wrong on all 3 counts. McCain hired Terry Nelson as his campaign manager. Since his fame and expertise came from the lying smear campaign against John Kerry, one would presume that this kind of tactic is what McCain most desires in his own campaign. As a Senator, McCain authored a piece of legislation that flatly says that "The United States of America does not torture". There was a nice ceremony with him and Bush hugging, smiling and signing it into law. Here's the catch, this law states that any technique used on people detained by US forces will not be called torture, even if it is. Oh, it gets better. The law specifically says that dubya can legally order torture techniques, and there is no limit has to how many people can be tortured, nor how long this torturing can last. So, what the law does is change the definition of the word "torture", and that's it. This is clearly an immoral and deceitful thing for any Bushie to do, but for McCain to be part of this is simply a higher level of immorality - further illustrating what he'll do to get elected. When asked about how Iraqis should view America, dubya replied that they owe him "a huge debt of gratitude" for the peace, prosperity and security he has brought them. If all of your news about Iraq comes from White House press releases and fox "news", you might even believe that. The sign in the [Basra] city center warns women that they'd better adhere to Muslim teachings or face the penalty. And all around the Iraqi city of Basra, women are showing up dead -- many beaten and beheaded. Some have been strangled to death, their faces disfigured. All bear signs of torture. "We thought there would be freedom and democracy and women would have their rights. But all the things we were promised have not come true. There is only fear and horror." But the Republican talking points keep plugging on about how well off Iraq is, how their strategy has been playing out so well, and how we must repeat this "success" by going to war against Iran. So, Romney dropped out of the race today. Not surprising, it's a business decision and the odds are now stacked against him. He never had much of a platform (other than claiming to be the next Regan), just deep pockets. Of course, he did want to differentiate himself from other strong candidates that have already bowed out, like Edwards, Dodd, Biden or Kucinich. They all had words of hope and encouragement, and well wishes and/or advice for the remaining candidates. What does Mitt do? Exactly what the party tells him to do - use the spotlight to claim that folk not blindly following the Republican party line necessarily want to surrender America to al Qaeda. Bald-faced lies attacking the integrity of good people, the hallmark of the new conservative mindset. Why don’t you take a look at the real world, you lying politico? Your hero Bush and his neocon puppetmasters have been giving Afghanistan back to the Taliban and al Qaeda ever since they ordered the US military to let Osama bin Laden escape from Tora Bora into Pakistan. 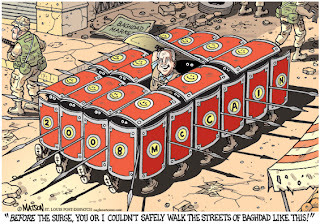 Only 15,000 troops there with 150,000 troops in Iraq to protect their cash cow war profiteering. You do the math of what your party truly cares about. Can you handle that? Good riddance, Mittens. "The tail-end of a presidency"
Sir -- Your review of a book on happiness and where to find it ("It's in Iceland", January 19th) mentioned that Republicans are happier than Democrats. This can probably be explained in the same way that dogs are happier than their owners: they can't grasp the concept of cleaning up the mess they leave behind. Bush revealed the latest Republican budget debacle. He wants $515,000,000,000 for “baseline” defense spending – just to run day-to-day operations. This is bigger than the combined defense spending of every other country on the planet. $21,000,000,000 is allocated for nuclear weapons. This does NOT include any money for the “war on terror” (Minimally $200,000,000,000 more) or the wars in Iraq an Afghanistan. Those items, once again, were left off the budget to make the number look smaller. But even though Bush has forgotten about these realities in the GOP budget, they do indeed exist, and that money will have to be added to the real budget for the next President to deal with. $1B is wanted for the FBI to create a database to keep track of every American’s palm print and retina scan. Quite a daring extension of the Republican ideal of a fully monitored police state. Meanwhile, it has been revealed that homeland security has not been improving under Bush’s direction, so the question remains just where all that money is going? So, with all of the GOP increased governmental spending, are there any cuts? You bet there are - to the very people that the government is supposed to serve. Bush wants to cut $200,000,000,00 from Medicare and Medicaid to make sure the poor and lower middle class do not get adequate healthcare. Bush also wants frozen budgets for infrastructure and education. Keep in mind that we have inflation, population growth and a 7-year history of shortcutting infrastructure and education. So this “freeze” is really a significant cut in services to taxpayers. His proposed $400B deficit, besides his pet war, also does not take into account the economic stimulus package. So, while this looks like his last shot at injuring America before he must give up power – it worse than that. He's even planning on selling more of this country to Saudia Arabia and China in order to finance his massive budget imbalance. Meanwhile, just last month 28,000+ manufacturing jobs were lost and 27,000+ construction jobs were lost. Oil companies (you remember, they’re the ones that wrote the US energy policy that the GOP rubber-stamped) continue breaking all-time profit records, further squeezing the working class. The Bush economy is coming into full swing, presumably as planned to create a disaster for the next, Democratic, administration to deal with. Remember after 9/11 how we wanted to get the guys that hit us? Remember how we started to, but then let them go so we could punish Iraq and plunder both their oil and the US treasury in the resulting chaos? Well, due to a successful "Operation Ignore*", Afghanistan is once again plunging into chaos, the Taliban is surging, and dubya and the GOP are leaving the mess for the new Democratic administration to finally deal with. Bush's plan? We've got 15,000 US troops in Afghanistan to fight the enemy that attacked us on 9/11. 150,000 are in Iraq to secure their oil. So, publicly mock and ridicule our allies, and then whine and complain when we don’t do as we say. Meanwhile, the Bush Administration has all but ignored (taking the advice of political advisors, and ignoring the advice from real expert advisors) preparing the US military for dealing with future potential attacks on American soil. I suppose he figures that nobody would ever want to do so ever again. Republican strategy, values and priorities. Ugh. * "operation ignore" coined by Al Franken. Excellent writer. OK, so very few people on either side of the aisle (or those of us who care about the country more than political sides) had high expectations of Bush for his last State of the Union. Amazingly, even with expectations lower than his approval rating, he still shows why he's become synonymous with "miserable failure". His biggest theme seemed to be railing on Congress for all the problems that have accumulated during his reign. Let's start with his "war on earmarks". Keep in mind that behind his "nice on the surface words", he is threatening to do significant harm to the country by vetoing any economic help if any of his items aren't included, or any of the first list are included. Hold no illusions - he is outright threatening to veto the entire concept of an economic stimulus package if Congress wants to help seniors on social security or those who cannot find a job. Nice, huh. Sadly, it doesn't even stop there. He had a lot of nice language about stopping pork-barrel politics via executive order. However, let's look at the facts of his actions. His “earmarks” remark is referring to an executive order that will only apply to the next president, not himself. So, he’s whining that the pork that only he wanted (first 6 years) or that the sides compromised on (this past year) is now so horrible that he would veto any attempts to fight the coming recession. However, he blessed all of those earmarks, plus any that will come while he still holds office – but wants to pass responsibility for economic discipline to the next administration. Nice. Here's a CNN article for reference. Now let's move on to his favorite topic, the war against Iraq. Of course, he’s still equating Iraq to 9/11 by pounding home the point over and over again that al Qaeda is in Iraq – completely ignoring that their true power is in Afghanistan and Pakistan. As a reminder – al Qaeda was responsible for 9/11, Iraq had NOTHING to do with it. When we invaded Afghanistan, we had Osama bin Laden pinned down, and the military on the ground was pulled back, and he escaped with his fighters into Pakistan. My favorite part – he said he was directly speaking to the brave men and women in uniform (happy stuff, blah blah). We WILL get you everything you need to do your jobs. Uh, that would have been nice 7 years ago. It’s been about 5 years since it was leaked that they have to resort to scavenging Iraqi dumps for scrap metal to armor the vehicles. Still waiting for the up-armoring, dubya. Where’s the money been going? So, how are his actions matching up with his words of wanting peace? 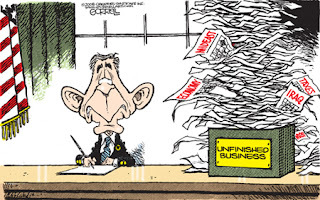 Well, on 1/29/08, Bush finally stopped selling F14 spare parts to Iran. Of course, this is not a direct deal between Bush’s friends in the defense industry and Iran – because that is illegal (such as Halliburton’s direct dealings). They use a third party to handle the transactions, and this has been well known for Bush’s entire presidency. However, the sale of US fighter jet parts to Iran has been going on for 7 years with his blessings. Arming the very country he is sabre-rattling against, trying to stoke a new war against new people before he leaves office. Meanwhile, the Iraqi people are trying to unravel the bush doctrine that has harmed them so badly, in a real attempt to heal a country from the ravages of both Saddam and dubya. Here's a BBC article. Hey, here's something he didn't talk about - his failure to help all the people harmed by hurricane Katrina. Besides blocking repairs of firehouses, here's the latest on the toxic trailers in another CNN article. As we continue to drown contractors in gold for helping to continue chaos in Iraq, of the 22 New Orleans firehouses destroyed by hurricane Katrina, the Bushie leadership has seen fit to have zero of them fixed. Guess that's one of the messes he's leaving for the next administration.